Today is a good friend's birthday and this cake almost didn't happen. Despite Najah being the first person I baked a birthday cake for two consecutive years, I was twiddling my thumbs about whether or not to attempt this up till the last minute. First of all, the birthday girl is on diet, hanging on to wholemeal-less dairy-low carb offerings, counting her calories and going to the gym despite her busy schedule. Secondly, there was no cake for her last year and I seemed to have gotten away with it - we had Indian vegetarian for her dinner treat (!). Thirdly, I only recently pounded a bunch of pandan leaves to make this green thing, so when Vijay came home one night to see me with my mortar and pestle on the floor, he had some questions. The thing is, Najah has a new found affection for that piece of green cake with brown frosting from Cedele (photo above, top row, left). Pandan butter cake with gula Melaka buttercream frosting sounds and tastes divine. With this in mind, I devised a recipe using Magnolia's famous vanilla cupcake recipe, swapped the milk with coconut milk and vanilla paste with pandan extract. I should have stopped there, but with all the ombre cake craze going around some of my favorite cake blogs lately, I had this insane idea to attempt the an ombre effect using just natural pandan extract. Except for a small commotion when I accidentally dropped half an egg shell into the cake batter while the mixer was running (never break your eggs directly into a running mixer, ever! ), the ombre cake layers came out better than I expected. A good 15 minutes was spent carefully passing the egg-shell-bombed batter through a sieve but I clocked good time in finishing the baking and even made it to the gym. The darkest layer was moist and tender, I ate all the scraps trimmed from the top crust. The Swiss meringue buttercream tasted incredible flavored with the gula Melaka caramel. I even managed to dress up the decoration the way I pictured it in my head. Over a dinner of Najah's nasi lemak and prawn sambal, when it came to the time of tasting the cake, this was what happened after she cut herself a huge slice - her son took the first layer and her husband the second two while she was away from the table, calling it the cendol cake (pandan, coconut milk, gula Melaka). She was left with the darkest layer, my favorite, and savored it slowly with some iced coffee. Even Vijay, who doesn't eat anything pandan (and especially not cendol), ate half of my piece. Not too bad for my first adapted creation I must admit! Cake recipe adapted from this Magnolia's Vanilla Cupcake, frosting recipe adapted from this Swiss Meringue Buttercream. Notes: The recipe is also good for an 8-inch round lower layered cake, layers are up to you, adjust baking time accordingly. Cake layers will be easier to ice chilled, with frosting at room temperature. To keep things simple and avoid from ending up with a mountain of dirty dishes in the sink, I weighed my KA mixing bowl beforehand, then weighed out the batter into four batches accordingly. Because of the liquid nature of my pandan extract, the darker cake layers are more moist and required gradual increase of baking time. If you're using pandan paste/essence/food coloring, baking time will vary less. Prepare the pandan extract: With a mortar and pestle or a blender, mash the leaves finely along with the water into a paste. Use as little water as possible. Press through a fine sieve or squeeze through cheesecloth to extract the green juice only. You should obtain at least 100 ml liquid. If you have the time, let it sit for a few hours. The green extract will settle at the bottom and you can remove the excess water before using. Bake the cake layers: Preheat oven to 350°F. Line and grease cake tins, set aside. In a small bowl, combine the flours, baking power and salt, set aside. In a large bowl, on the medium speed of an electric mixer, cream the butter until smooth. Add the sugar gradually and beat until fluffy, about 3 minutes. Add in the eggs, one at a time, beating well after each addition. Add the dry ingredients in three parts, alternating with the coconut milk. With each addition, beat until the ingredients are incorporated, taking care not to overbeat. Using a rubber spatula, scrape down the batter in the mixing bowl to make sure all the ingredients are well blended. Divide batter into desired portions and mix in the prepared pandan extract accordingly to color each layer. Bake each layer for about 25-40 minutes or until a cake tester inserted into the center of the cake comes out clean. Cool the cakes completely on a wire rack before icing. You can, at this point, cling wrap and chill/freeze the cake layers for later use. Make the frosting: In a heavy-based saucepan over medium low heat, melt the gula Melaka with the water. Stir till all the sugar has melted, then let it reduce slightly, about 3-4 minutes. Remove from heat and let cool completely to room temperature. The caramel will thicken more as it cools. If it becomes too thick, thin out with a little bit of water before using. Combine the egg whites, sugar and salt in a heatproof bowl over a pan of simmering water. Whisk frequently, keeping it over the heat, until the mixture reaches about 160°F/70°C and the sugar has dissolved (rub some between your fingers - if it feels grainy, it hasn't dissolved). Transfer the mixture to a mixer with a whisk attached and beat on medium-high for 8 minutes, until stiff peaks have formed and the mixture has cooled to room temperature. Turn down the speed to medium and start adding small chunks of butter, checking that it has incorporated before adding more. Keep beating until it comes together, this will take about 5 minutes. With the mixer running, add in the gula Melaka caramel, one teaspoon at a time, beating until well combined between each addition. Add between 6 to 9 teaspoons, according to taste. Assemble the cake: Secure the bottom cake layer (the lightest or darkest layer) onto the cake board with some frosting. Layer on frosting and add on the cake layers accordingly. Coat the entire cake with a thin crumb coat, then chill the cake for 15-20 minutes. Ice the cake and decorate as desired, with some desiccated coconut and piped rosettes. Do ahead: The pandan extract can be prepared before hand and chilled until required. Cake layers can be made up to 3 days before, frozen within 3 layers of cling wrap. 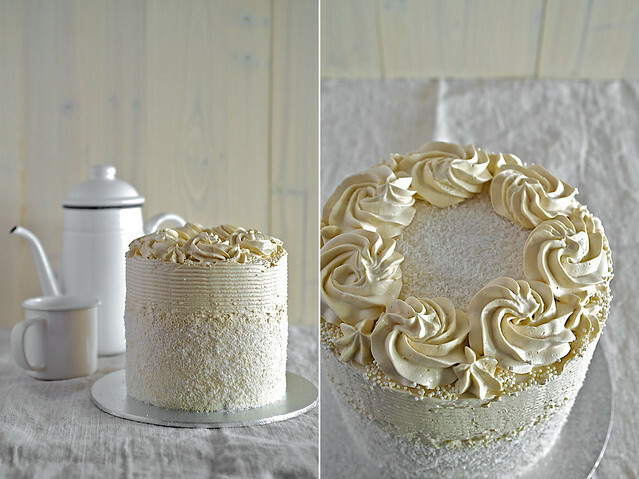 Swiss meringue buttercream can be made ahead and refrigerated till needed. 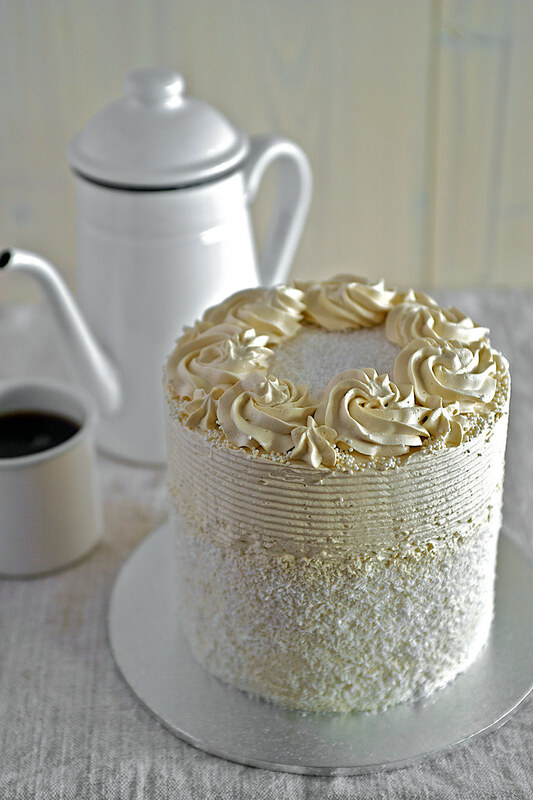 Bring to room temperature and whip to a smooth consistency before frosting. The buttercream requires no refrigeration for up to 5 days. It will keep in the refrigerator for 3 weeks and in the freezer for at least 3 months. indeed, not too bad for your first adapted creation. the decoration is beautiful. A splendid cake! I love the flavor of pandan. The decoration is lovely. Lan: Thank you. I thanked all my baking Gods things turned out well! Rosa: The flavor of pandan is unlike others. Place some leaves on the kitchen counter and the whole place would smell amazing! I have been a lurker for a very long time :) but you have de-lurked me with that white jug/kettle. Is it enamel? I have been looking for ages for one of them but alas have had no luck. 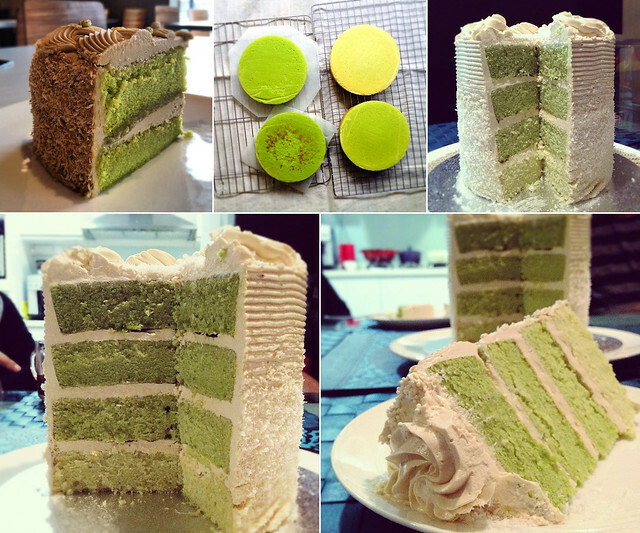 great minds think alike because i just posted a similar pandan ombre cake on my blog! but of course mine pales when compared to yours - mine consist only of three layers to your four and mine definitely do not look as pretty as yours! gonna KIV the gula melaka buttercream for my next attempt because cendol just happens to be my fave nyonya dessert! Cynthia: I bought the enamel pot and cup at my local shopping mall. For online resource I can only recommend Etsy, they have very good vintage collections and I've purchased a few items from their shops as well. Kulsum: Genius? Nooooo... I just lucked out this time. Though I did give the chemistry bit of it some thought. You haven't heard my disaster stories yet. Janine: Yes I saw your ombre chiffon. I'm not a fan of artificial coloring when I can avoid it, which is why I was adamant to color the cake naturally. The whole thing really did taste like cendol! Your cake is absolutely beautiful! I love the decoration and the lovely layers. Seriously impressed. You got me at cendol! Magnificent work! I've been looking for such a recipe after trying Cedele's cake n tried pandan cupcakes with gula Melaka buttercream but it was a disaster! Lovely cake n great post! I really adore your teapot too, may I know which shop and shopping mall you got it from? Am so going to get it too! I think this is the most beautiful cake you ever make. I am also in love with your white water jug. You have to tell me which shopping mall you got it from. It is in my list. Definitely. thelittleloaf: Thanks! I try to improve with every cake I make. Thank God this one turned out good. kankana: Thank you. My friend herself had turned into a baker for her friends ever since I made her her first cake. Norza: Hope you'll try this one! Anon: Thank you, try this recipe and hopefully you will like it. The jug was from Tangs a sometime back. Jun: Thank sweetie! Hope to meet you the next time you come. We go look for the jug at Tangs (you were so close to it the last time!). I got here when researching if I could make pandan cupcakes with ginger-infused buttercream (I had sweet potato tong sui recently and wondered if it will work in a cake) but gula melaka sounds divine! didn't think of substituting milk to coconut milk. will try to make a batch of cupcakes soon. thanks for the inspiration! FeR: You're welcome, hope the recipe works for your cupcakes! Only have frozen pandan leaves. Maybe I have to try again pounding the lot and leaving it to sit so I can use the extract. FeR: My advice is to double the amount of leaves since the frozen ones will not yield as much flavor and color as fresh ones. Pound about 20-25 pieces of large leaves (more if smaller), let the extract sit overnight, then use the sediment only. All the best! Hi, I got to try it before I read your reply - it's finally green! ;) yay! 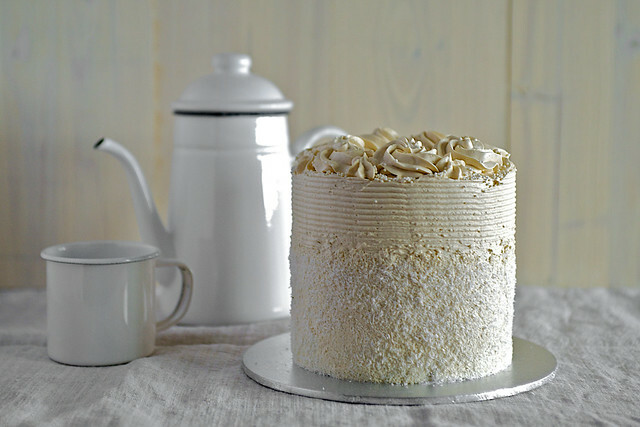 Being cold here, buttercream was uhm...like eating chunks of butter but my friends loved it! Thanks again for sharing! FeR: Yay for the green! Cold SMBC is really like eating butter. I assume you're in Australia? Perhaps you can try a normal buttercream recipe then since it's cold where you are, it can also be flavored with gula Melaka. Glad your friends liked it! Hi, I'd like to know if the buttercream would melt in hot & humid weather? OMG this cake is soooooooooo pretty! i was so inspired so bake gula melaka cupcakes aft having cedele's cake. I googled for recipe and found your page. GEM! laluu: Hope this turned out good for you! what kind of decorating tip did u use for the swirls? Anon: I used a closed star tip for the swirls, example here. Completely amazing!I just learned about Pandan at a local Indonesian restaurant. This is fantastic! Otehlia: Pandan is an essential Asian ingredient. It is truly unique and yes, amazing! This cake is amazing! Everyone loved it, and some even say it's the best one I've ever baked. I got a lot of compliments and positive feedback. Thank you for this recipe! hihi, i chance upon your post while searching for a gula melaka frosting. your cake looks really great! may i ask if 2 tablespoons of vanilla extract is correct? sounds like alot to use. thanks. Sherlyn: Yes, 2 tablespoons is correct. The buttercream recipe is enough to frost a 3-layer 9-inch cake. The taste of butter is quite prominent in SMBC, so a bit more flavoring is needed. Such a great blog u have. Keep it up! Suzana: Yes! All the best with the results! Didn't try for the ombre, but want to do so for next time. Love the cake! Shall make one very soon. Thanks for the recipe. I'm a beginner in baking and am baking this beautiful cake right now. I have this problem which I can't figure out why, my frosting is very runny? What a great recipe! I've tried it but made it into cupcakes. I've also shared it in my blog. Thank you again. Would you be willing to get paid for making a small version of this cake?